Carrie Underwood has and always will be "The Champion." "I'm going to be honest, 'bouncing back' after having Jacob has been much more difficult than after I had Isaiah and I've been pretty hard on myself lately. I go into the gym and I can't run as fast or as far," she shared on Instagram with her 8.4 million followers. "I can't lift as much weight or do as many reps as I could a year ago. I just want to feel like myself again...for my body to feel the way that I know it can." She continued, "As I was working out today, I realized that for the past 11(ish) months, my body has not belonged to me. It was a perfect home for Jacob. And even now it belongs to him every time he drinks his milk." 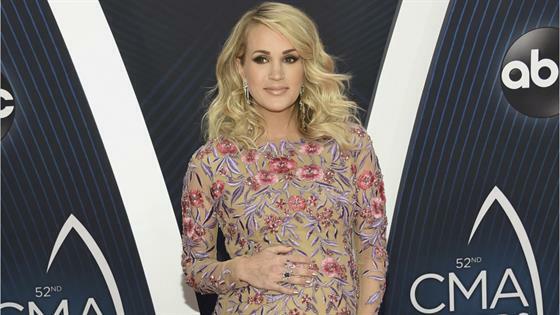 As Carrie prepares for red carpets such as the ACM Awards or her upcoming tour with Maddie & Tae and Runaway June, she is focusing on what her body "can do" instead of "what it can't." "I promise to stop analyzing every angle and every curve and every pound and every meal. I'm going to keep staying the path because it is a journey and as long as I'm always working towards my goals, one day I'll reach them," she wrote while posing in her CALIA by Carrie fitness apparel. "I'm going to take it day by day, smile at the girl in the mirror, and work out because I love this body and all it has done and will continue to do! #bodyafterbaby #fitmom #healthy #staythepath @caliabycarrie." Country singers Jana Kramer, Maren Morris, Hillary Scott and Kelsea Ballerini were quick to "like" the post while Carly Pearce commented, "Love your truth @CarrieUnderwood!!! So Inspiring." As for how she balances it all, it's safe to say everyday is an adventure. "Ask for help. Accepting help is hard for me, but I'm learning," she previously shared with Redbook. "Sometimes I feel guilty that this is my son's life: We live on a bus and we're in a hotel room and sometimes we're in the middle of nowhere and it's not so great. It's not all glamorous."